Sponsored by Kroger. All opinions are my own. It’s Halloween season once more and I’ve been thinking hard about what kind of easy Halloween makeup tutorial I can share with you all this year! You know I’m all about being able to use makeup you already own, or at least affordable makeup you can pick up and still use past the holiday in your normal beauty routine. 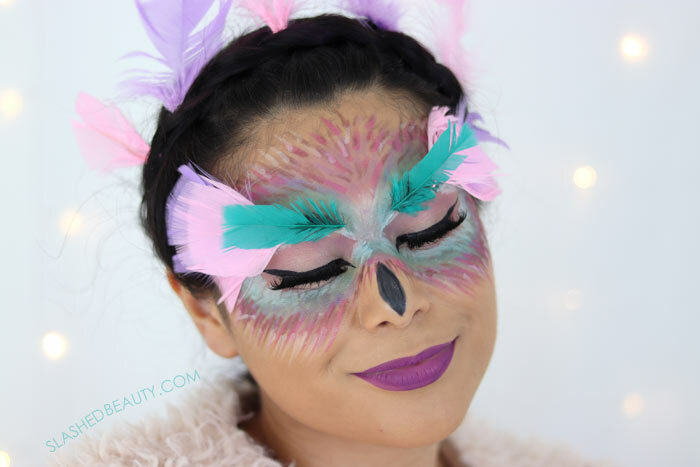 Looking at my own collection of makeup, I knew that I had a bunch of bright colors that were about to hibernate for fall and winter, and I thought I’d give them one last hurrah in this bright fantasy owl Halloween makeup look. After assessing what I already had, I picked up some extra products to finish the look from my local Smith’s grocery store, which is part of the Kroger Family of Stores. Today, I’m partnering with them to share the beauty promotion they’re running just in time for Halloween: from October 17 through 31st, Buy 2 Get 1 Free on cosmetics, nail care and accessories, and you can mix & match brands! 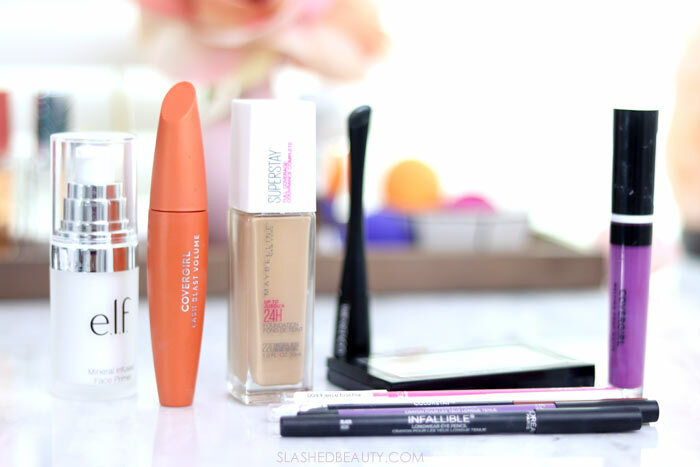 That means you’ll be able to pick up all the makeup products needed for this look with some big savings. 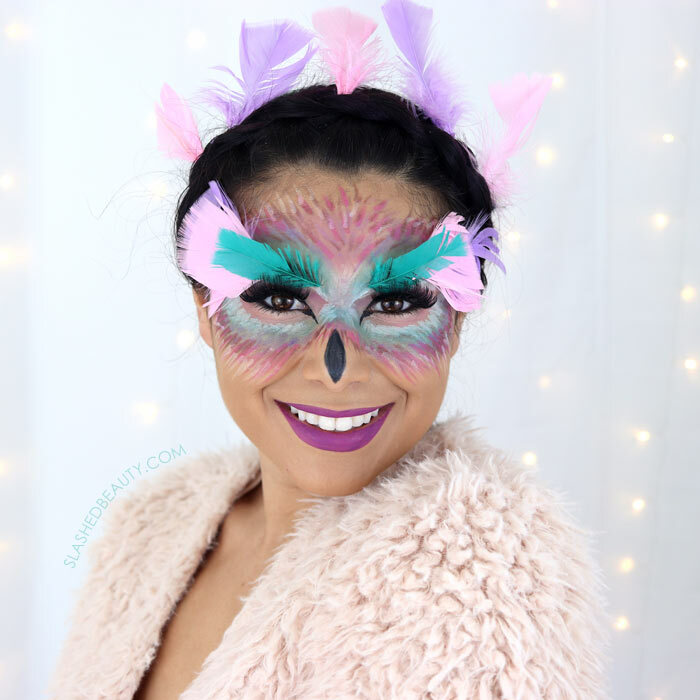 Watch the video at the top of the page to see the step-by-step owl halloween makeup tutorial. Even though this Halloween makeup look seems elaborate and time consuming, it’s actually quite easy to recreate! Plus, since you’re going for a feathery look, your technique doesn’t need to be perfect or neat. What is probably the most time consuming is affixing the feathers to your face, especially if you decide to trim them. But even then, it’s pretty simple with lash glue to stick them on right over your brow. Feel free to add more or less than I did in this tutorial– this look is totally customizable! Owls are one of my fave animals, and I love this fantasy take on the animal with all of the bright colors. To finish the costume, I threw on a fluffy jacket I found at a thrift store over a pair of black leggings. 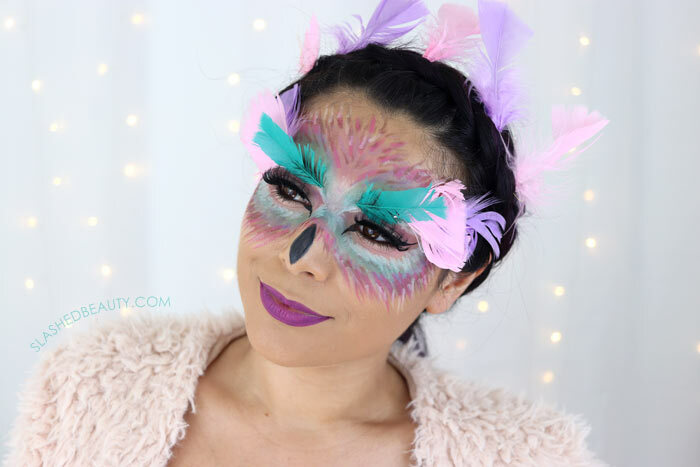 This is definitely a makeup-focused look so you can wear whatever you already have, just try to match the color scheme for a more cohesive costume. Anything soft will do. Have fun recreating this easy look, whether you’re using it as a Halloween costume for school, trick or treating, or a costume party! Be sure to shop the Kroger beauty promotion for all your Halloween and other beauty must-haves next week. In the mean time, check out the Kroger site for more tutorials, inspiration, and exclusive coupons and offers.